Sonic Soil Sampling Inc. is a limited Canadian company, incorporated in August, 1981, with its head office in Toronto, Ontario, Canada. Since then we have moved to larger facilities in Concord, Ontario to consolidate our office, testing and storage facilities. 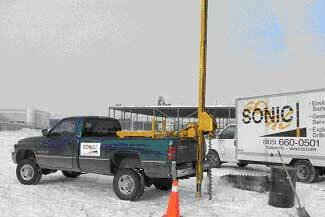 Sonic's primary objective is to provide a cost-effective, environmental and geotechnical drilling service. This goal is achieved by utilizing innovative and portable equipment, as well as a professional staff, to perform a variety of tasks including sample collection and the installation of monitoring wells. Working with the environmental sector we have completed programs in sensitive areas that could not be accessed by conventional drilling equipment, including First Nation Reserves and Canadian Air Force Bases. We also have conducted numerous sampling programs for the industrial and mining sectors throughout the world. Our crews use the Pionjar 120 Drill and Electrical Drilling Units with standard 2" split-spoon samplers to drill inside factories, alongside busy streets and highways, on lagoons and tailings ponds, and at mines and remote sites. This hearty piece of equipment has achieved depths of 50', although our primary target horizon is typically up to 20' in depth. Portability is the key component for utilizing the Pionjar, virtually wherever you can walk we can get our equipment in and achieve your sampling needs. 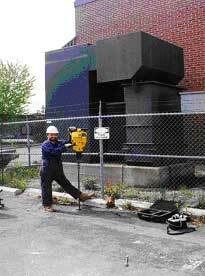 Our crews can also be equipped with a Portable Auger Unit capable of using 4 inch solid stem augers or 6 inch hollow stem augers for installing 2" monitor wells for groundwater inside and outside buildings. When your program calls for indoor sampling, we can isolate the power pack outdoors and position our drilling equipment indoors, through ordinary doorways. For those instances when you require a more powerful auger, but don't have the access, we also offer you the availability of a 4x4 Truck mounted auger drill. With 4-wheel drive we can access areas that are off-road or tight location in-town. 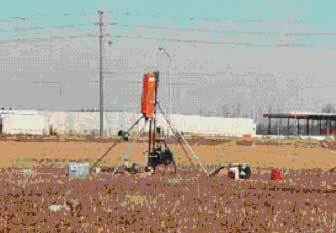 We also provide portable geotechnical testing equipment for SPT and for soil load profiles. At Sonic, we offer an automated SPT system that utilizes a 140 pound drop weight that can either advance a cone or a split-spoon. For those areas that have extremely limited access, whether it's an isolated basement or remote bush areas, we also offer the Manual 70 pound drop weight. In addition, all of our crews use electrical concrete coring machines with diamond bits for concrete coring and road testing. Drilling services in Canada are covered by a 5 Million Dollar General Liability insurance policy at all work sites. In addition, the company has a comprehensive Pollution Insurance Policy and our staff is provided with up-to-date Workers Compensation coverage's. The Drilling Systems we offer you at Sonic are a cost-effective solution for the environmental and geotechnical sampling of shallow soils. No longer are you restricted to large, truck mounted drilling rigs on environmental projects and sensitive work sites. Accessibility to most sites is greatly improved by the portability of our drilling equipment and ground instability is diminished on many sites including excavated areas, confined spaces, ditches and wet mine tailings. With greater accessibility, your customer has less disruption of business and less mess associated with the 'larger drill rigs'. This makes your customer happier and in turn generates more repeat customer satisfaction. Call us for a free quotation. You are not limited any more on location, type of equipment or cost. We look forward to working with you on your next project. The Pionjar120 Soil Sampling System is portable, enabling the unit to be carried into environmentally sensitive and/or densely vegetated areas. The complete system is compact and can be transported by aircraft, helicopter, pick-up, van or a 4X4 vehicle. 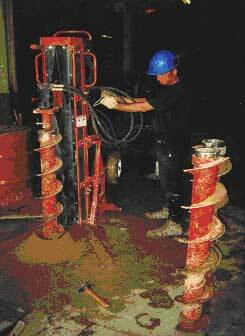 The system is being used to drill alluvial sediments, laterites, saprolites and caliche materials in South America, Central America, and Africa. The Pionjar 120 Drilling System is a cost-effective solution for the environmental sampling of soils between 5 to 8 meters in depth. No longer are you restricted to large, truck mounted drilling rigs on environmental projects and sensitive work sites. Accessibility to most sites is greatly improved by the portability of our drilling equipment and ground instability is diminished on many sites including excavated areas, confined spaces, ditches and wet mine tailings.